The job postings from the national activist group further lift the curtain on a campaign that has been telling the public and media that they are proposing “common-sense, down-to-earth proposals” in an effort to sound more appealing to voters. But the job ads make it pretty clear that they are recruiting staff for a campaign to ban-fracking. 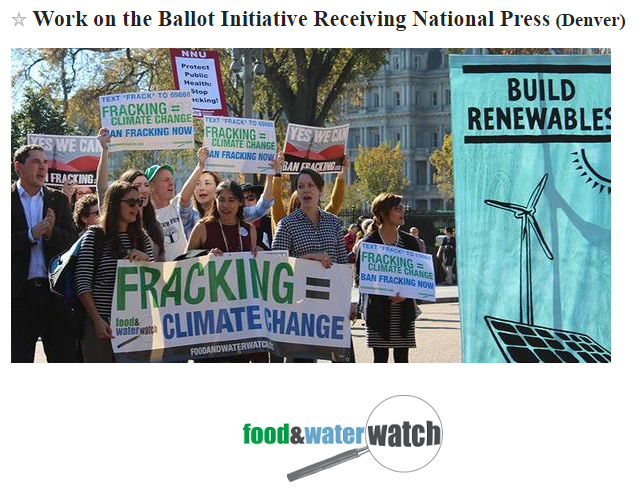 Another post features imagery of activists carrying the familiar F&WW “Ban Fracking Now” and “Yes We Can Ban Fracking” signs that are a constant presence at anti-fracking events. As EID has previously reported, F&WW is behind the creation of statewide groups such as Frack Free Colorado, Protect Our Colorado and Local Control Colorado as an attempt by the organization to put a local face on the group’s national agenda. According to The Colorado Statesman, F&WW is one of the “major players behind the anti-fracking movement” in our state and “played a key role in supporting initiatives to ban or delay fracking in local communities” in Colorado, starting with Longmont in 2012. Even though national activist organizations descending on Colorado to push anti-fracking ballot initiatives may have dropped an earlier proposal for a statewide fracking ban, it is obvious that they know their remaining initiatives would end up having the same effect, and would be just as damaging to the state’s economy. So while F&WW signature gatherers hit the pavement to portray these measures as nothing more than “local control” and “increased setbacks,” it is likely that Coloradans, who overwhelmingly support oil and gas development, will understand that their goal remains the same.